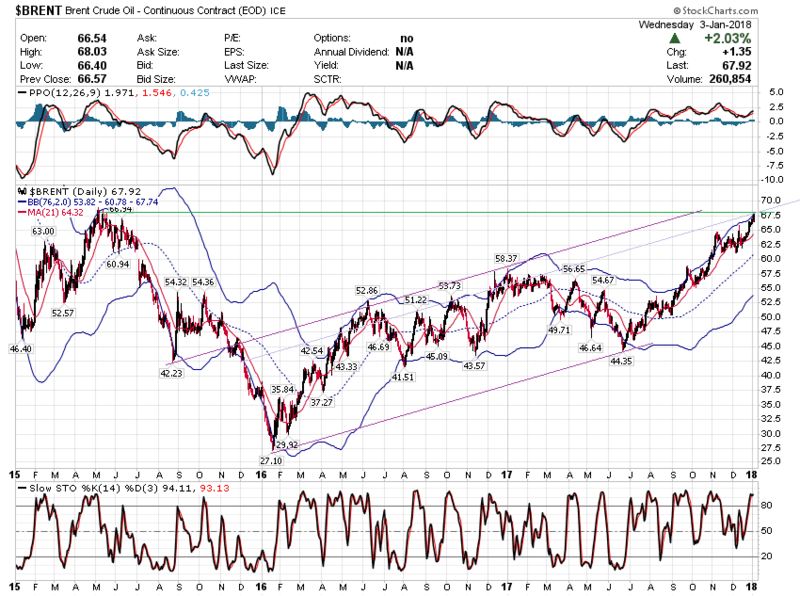 Will Oil & Oil shares continue to fight higher, piercing nearby resistance? It kind of makes sense that food is low. A very good thing in terms of keeping the people fed. They complain about student loans and housing instead. 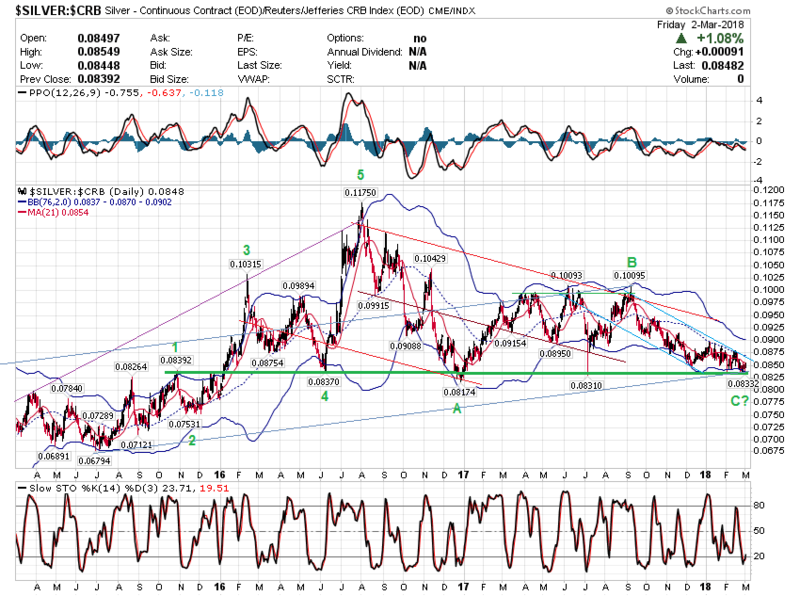 Gold can go either way in my view, like Jim Rogers said. The central bankers seem to be very comfortable with the situation. They are taken by surprise at the economic growth last year. Barring any geopolitical shocks I guess they will slowly unwind their balance sheet. Markets are going into a bear market as that money is withdrawn. Interest rates will rise rather sharply within 6 months. Therefore we should be on the watch for deflation not inflation. 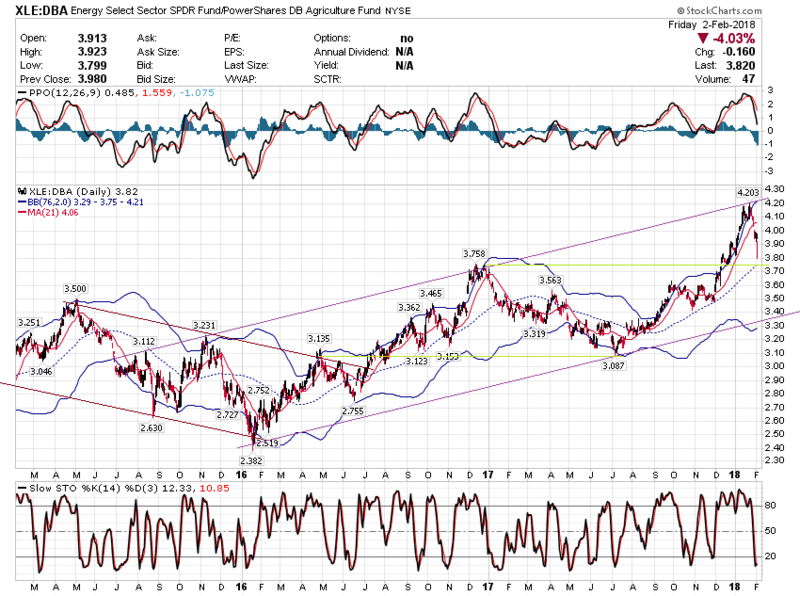 Limited Risk Food/Grain Inflation play? Buy this Call when cheap? Gold prices push to fresh four-month highs as investors wait for inflation data : 0.2%? Gold prices were aiming at fresh four-month highs on Friday as investors got ready for a batch of important inflation numbers due later. February gold GCG8, +0.39% rose $6.40, or 0.5%, to $1,329 an ounce. On Thursday, the contract finished up 0.2% to $1,322.50 an ounce, the strongest settlement for a most-active contract since Sept. 15, according to FactSet data. Gold is now looking at a weekly gain of around 0.6%, while month-to-date the metal is up 1.5%. The ICE U.S. Dollar Index DXY, -0.10% — a gauge of the greenback against a half-dozen rivals — was steady on Friday, but set to lose 0.1% for the week. A weaker dollar can boost the appeal of gold as an investment, as most commodities are priced in dollars. On the flip side of that, a stronger dollar can often weaken gold. Coming up for investors are important December consumer price inflation numbers, due at 8:30 a.m. Eastern Time. Closely watched core prices are expected to rise 0.2%, following a 0.1% gain in November, according to economists polled by MarketWatch. Headline CPI is forecast to rise 0.1%, after a 0.4% jump in November. Economic preview: Is inflation ever coming back? Of concern for investors in gold is if inflation comes in stronger than expected, which could speed up the Federal Reserves expected plans to increase interest rates. Rising interest rates increase the appeal of holding dollars, but also hurt gold as it’s largely priced in the currency and it doesn’t offer a yield. Just received a note from John Murphy. 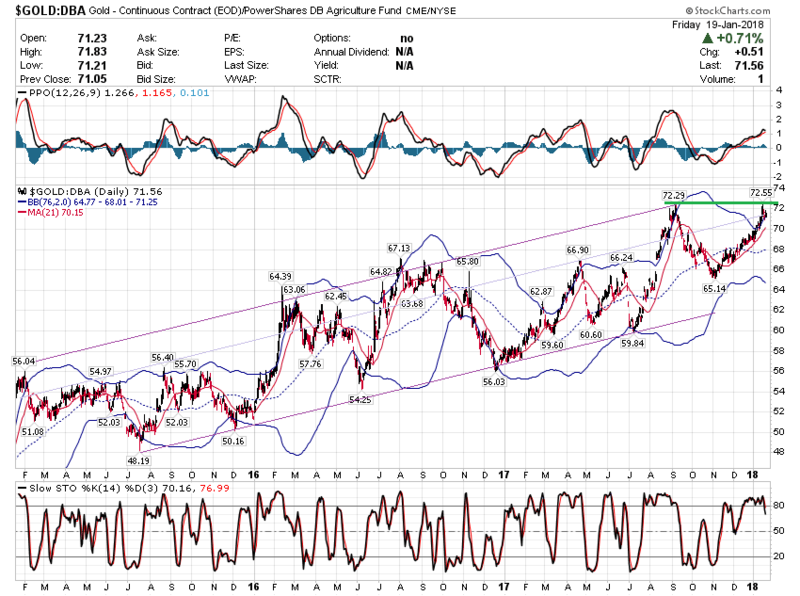 Think food is gong to rally regardless of which way the currencies move. Any agricultural exposure should do fine. 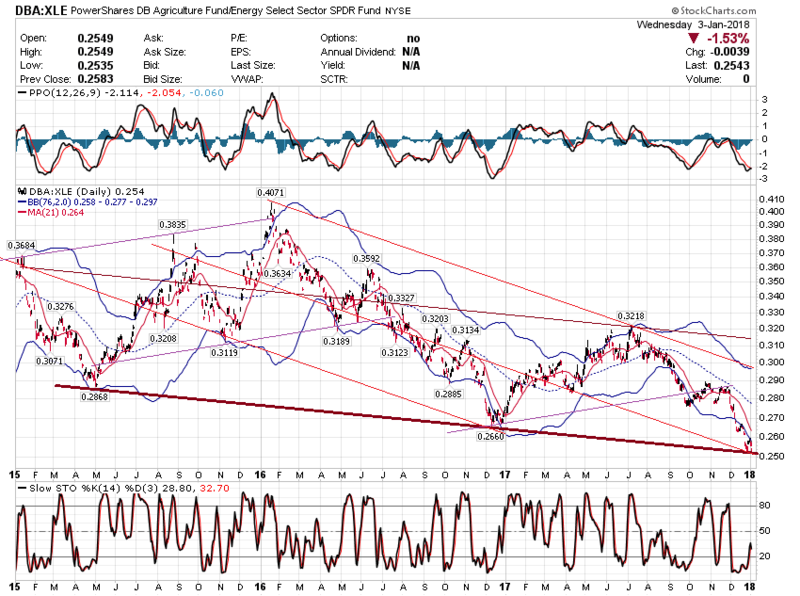 Have been following DAG, double agriculture etf, it has been ripe for a bullish phase for a long time. Inflation increased last month due to higher housing costs, reinforcing the outlook that the Federal Reserve will possibly raise interest rates several times throughout 2018. The core consumer price index also increased 1.8 percent from a year earlier, according to Bloomberg. Higher inflation is generally linked to higher gold prices. Many countries around the globe are experiencing labor shortages, including Japan and Germany. 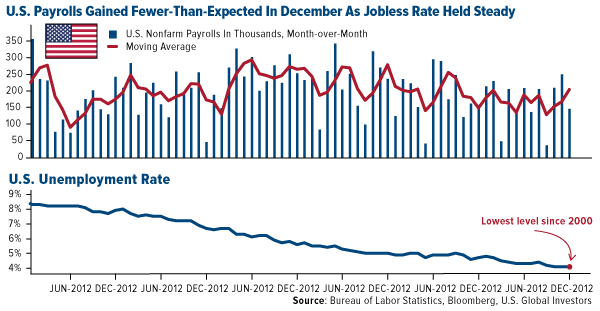 Labor shortages often lead to higher wages, which in turn increases inflation. Although this has not happened to the U.S. yet, Federal Reserve Bank of New York President William Dudley noted in remarks this week that if labor markets were to tighten much further there would be greater risk that inflation could rise substantially as some think the economy is at risk of overheating due to the tax cuts. 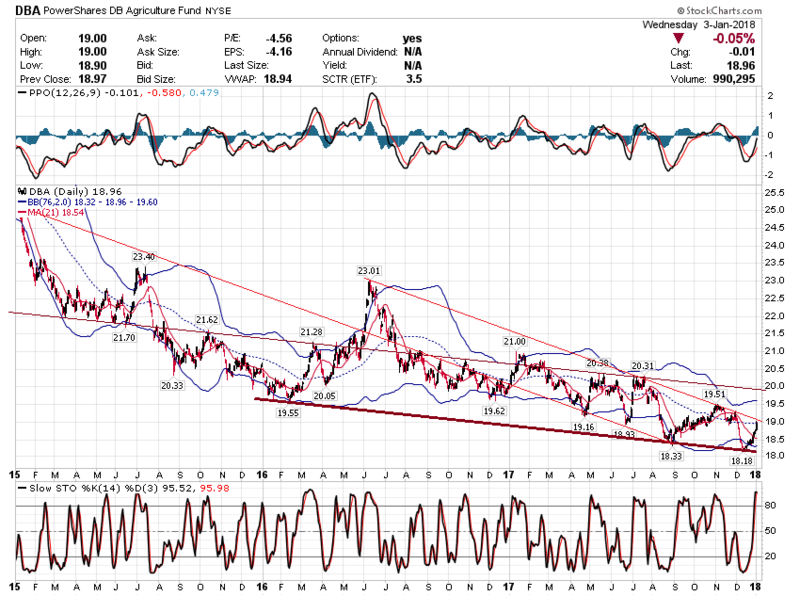 Commodities Ready for Mean Reversion? 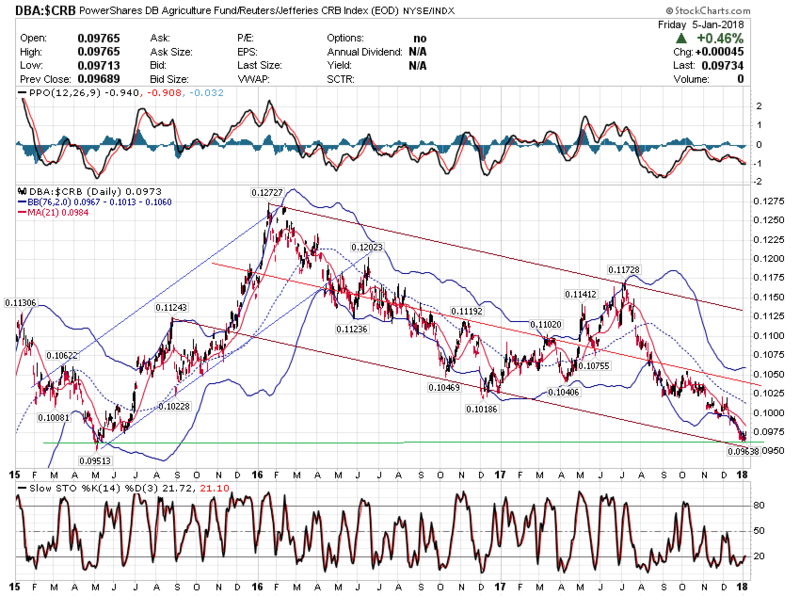 Last month I shared with you a chart, courtesy of DoubleLine, that makes the case we could be entering an attractive entry point for commodities, based on previous booms and busts. 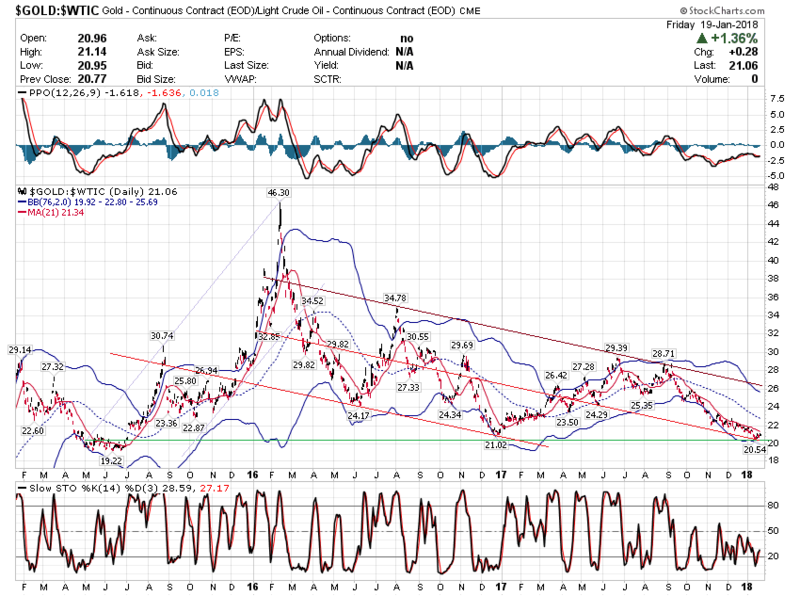 The S&P GSCI Total Return Index-to-S&P 500 Index ratio is now at its lowest point since the dotcom bubble, meaning commodities and mining companies are highly undervalued relative to large-cap stocks. 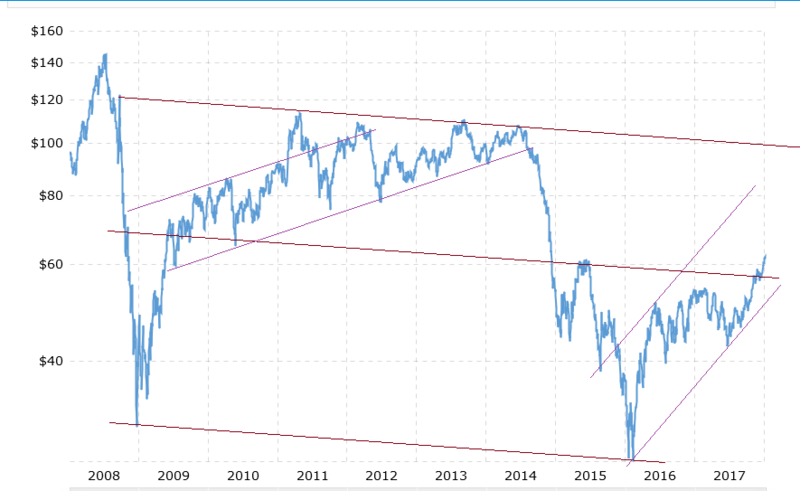 We could see mean reversion begin to happen as soon as this year, triggering a commodities super-cycle the likes of which we haven’t seen since the 2000s. Gundlach has more to say on this subject. 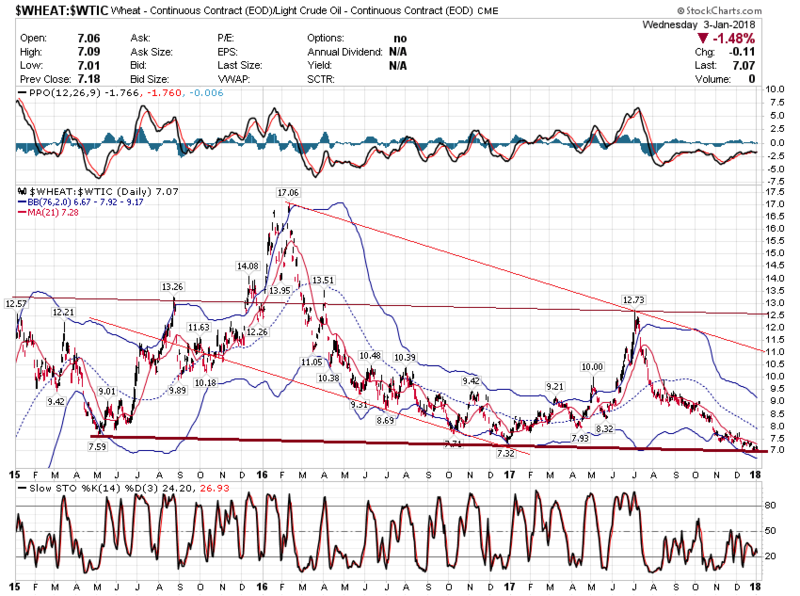 During his annual “Just Markets” webcast, he told investors that “commodities will outperform in 2018” because they “always rally sharply—much more sharply than they have so far—late in the business cycle as we head into a recession. Middle class benefits are being revoked in the name of affordability. Because of several factors including stagnant wages, rising costs, and politics, being a member of the American middle class is quickly losing what little prestige it has remaining. Private companies hired another 234,000 in January, well above expectations for 185,000, according to ADP and Moody's Analytics. Service-related industries led with 212,000 new jobs, though manufacturing added 12,000 and construction 9,000. The report often differs significantly from the government's more closely watched nonfarm payrolls count, with ADP reporting growth of 242,000 in December vs. the Labor Department's 148,000. U.S. hiring picked up in January and wages rose at the fastest annual pace since the recession ended, as the economy’s steady move toward full employment extended into 2018. Nonfarm payrolls rose 200,000 -- compared with the median estimate of economists for a 180,000 increase -- after an upwardly revised 160,000 advance, Labor Department figures showed Friday. The jobless rate held at 4.1 percent, matching the lowest since 2000, while average hourly earnings rose a more-than-expected 2.9 percent from a year earlier, the most since June 2009. Treasury yields and the dollar gained, while stock futures remained lower, as the data reinforced the Fed’s outlook for three interest-rate hikes this year under incoming Chairman Jerome Powell, including one that investors expect in March. The figures may also add to the likelihood of a fourth rate increase in 2018. U.S. stock-index futures added to losses on Friday after January jobs report showed the economy added 200,000 jobs last month. The unemployment rate remained at 4.1%, while wages grew by 0.3%. The report was better than expected and underlines the Federal Reserve's willingness to raise interest rates three more times this year. The Dow Jones Industrial Average futures YMH8, -1.31% were 255 points, or 1%, lower at 25,920. The S&P 500 index futures ESH8, -0.99% were down 22 points, or 0.8% to 2,801, while the Nasdaq-100 futures NQH8, -0.78% declined 32 points, or 0.5% to 6,867. Oil falls (-9.6%). More than stocks (-5.1%) as people talk "Stock Crash". But China stocks fall almost 9%. The Consumer Price Index, a key indicator of inflation trends, jumped 0.5 percent in January, well above market expectations. Markets reacted sharply to the news, with stocks sliding and government bond yields rising. The Fed is watching inflation closely, so the report could add fuel to interest rate hikes. The Consumer Price Index rose 0.5 percent last month against projections of a 0.3 percent increase, the Labor Department reported Wednesday. Excluding volatile food and energy prices, the index was up 0.3 percent against estimates of 0.2 percent. The report indicated that price pressures were "broad-based," with rises in gasoline, shelter, clothing, medical care and food. Markets reacted sharply to the news. The Dow opened more than 100 points lower, but reversed those losses after the first half-hour of trading. Government bond yields also turned higher, with the benchmark 10-year note most recently trading near 2.88 percent, a gain of about 3.8 basis points. Investors also began to price in the likelihood that the Federal Reserve will raise interest rates at least three times this year. On a fundamental basis it was President Trump’s proposal to implement tariffs on steel and aluminum that created the recovery. 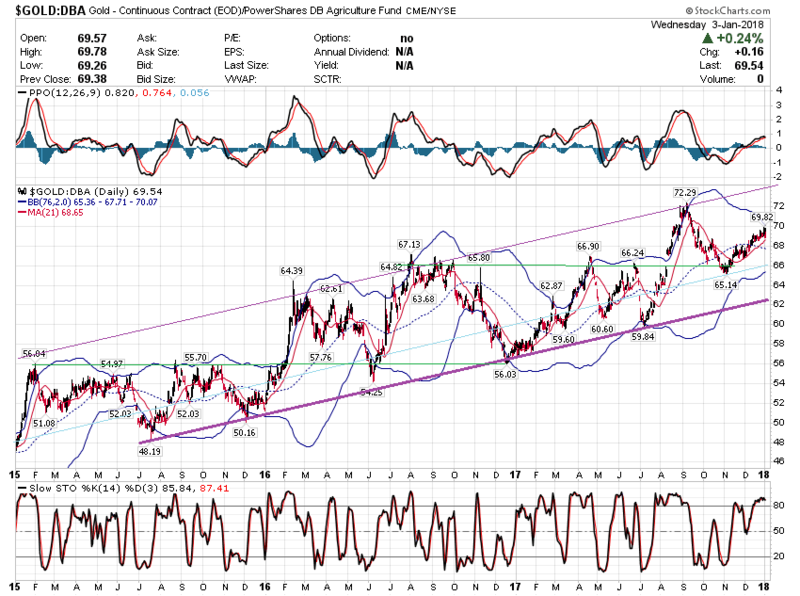 These actions have a high probability of leading the US into a trade war, which would result in sizable upside spike in inflation, which would be extremely bullish for gold. Platinum futures lost almost 2% on the day and are currently fixed at $969.60. At the same time, palladium futures lost over 5% in value as they dropped over $53 in trading today, with palladium futures currently at $983.90. These precious metals are obviously reacting to their industrial component as President Trump proposes tariffs on steel and aluminum that could dramatically impact automobile sales in the United States. As such, these two precious white metals traded significantly lower and as of this writing have not recovered. For those who would like a deeper analysis, simply use this link. STEEL is no longer a Steal - Time to sell? 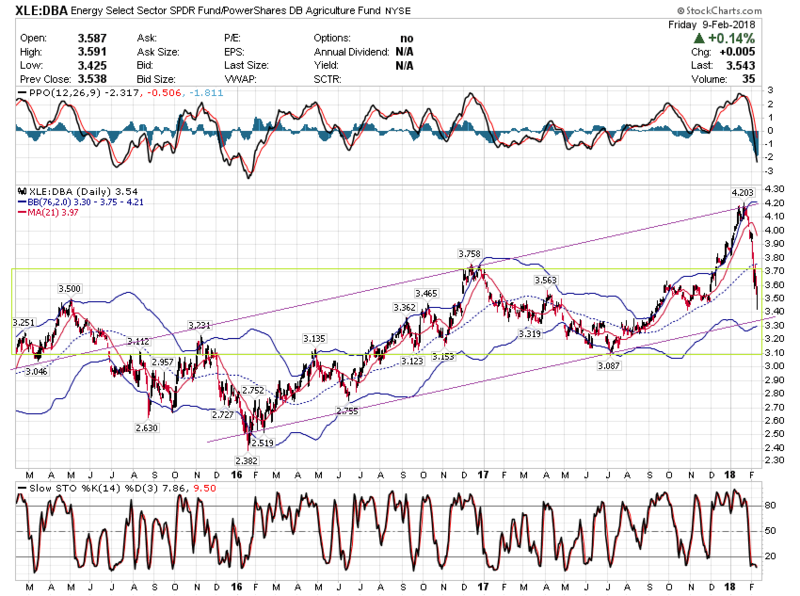 Or will Inflation take off? If it breaks through the Resistance, and trades over $48, there could be substantial upside. 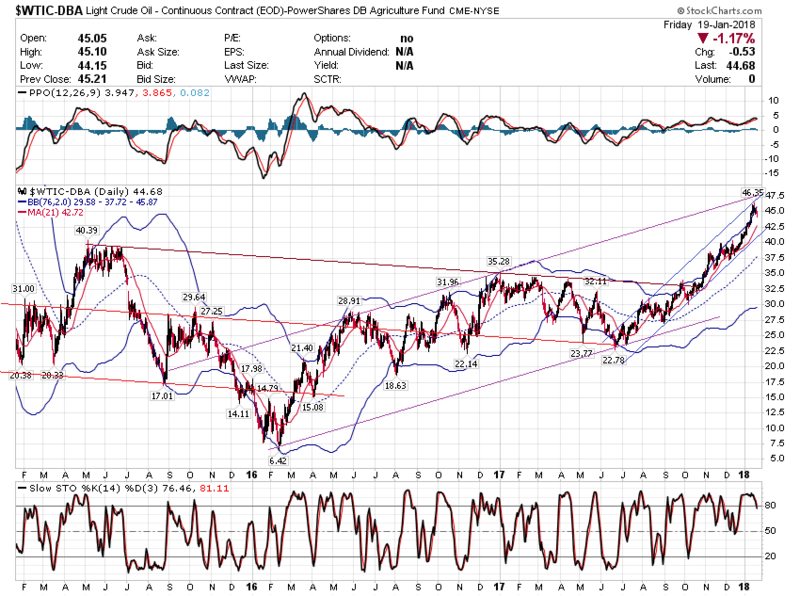 Should the stock be part of the "Inflation Watch"? Probably. 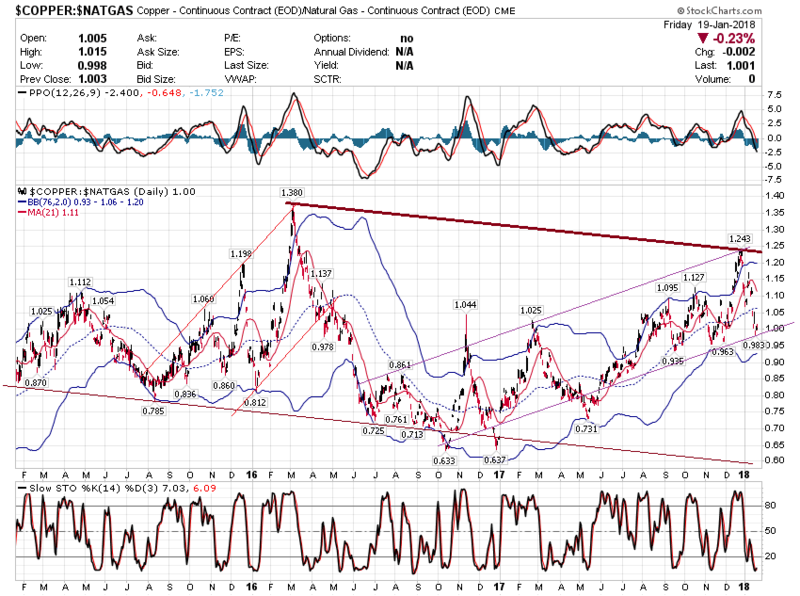 If X-Steel and DBA-Grains rise, will it unleash the "coiled spring" in Silver prices? 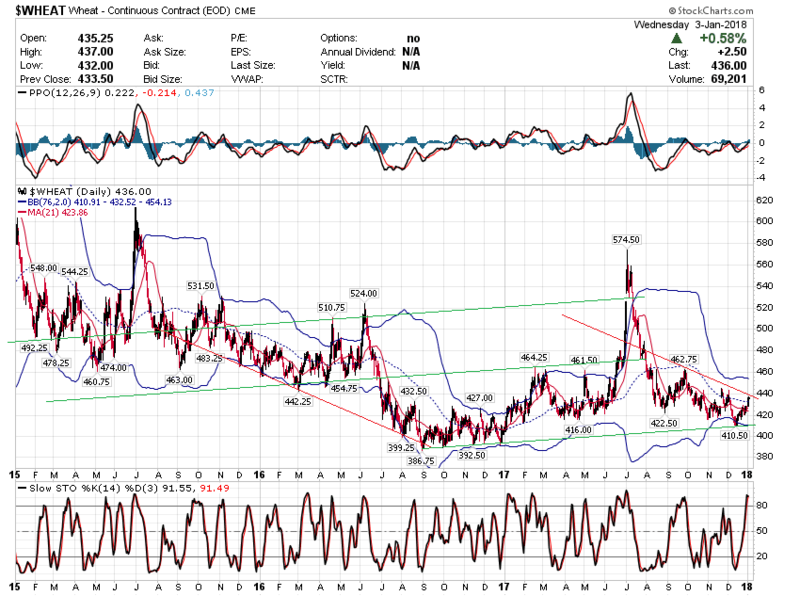 The Ratio has traced out a textbook A-B-C correction which may be done, or nearly done. Gold and silver prices were ending the U.S. day session with solid gains Wednesday, on safe-haven demand. Gold hit a seven-week high today and silver notched a two-month high. There is elevated anxiety in the marketplace at mid-week regarding U.S. military intentions after Syria used poisonous gas on its civilians. President Trump tweeted today, warning Russia that U.S. missiles are coming and that Russia won’t be able to shoot them down. He also said Russia should not be aligning with an “animal” (Syria’s Assad) that gasses his own people. June Comex gold futures were last up $15.30 an ounce at $1,361.00. May Comex silver was last up $0.209 at $16.805 an ounce. Gold prices pushed to session highs after U.S. inflation data came in weaker than expected. Wednesday, the U.S. Labor Department said its U.S. Consumer Price Index fell 0.1% in March, after increasing 0.2% in February. The drop was weaker than expected as consensus forecasts were calling for an unchanged reading. The decrease in inflation pressures did not have a major impact on the annual data. For the year CPI rise 2.4%, its highest read in a year. Monthly core inflation, which strips out volatile food and energy costs, rose 0.2%, following a 0.2% increase in February. The data was in line with economist expectations. Annual core inflation jumped to 2.1% last month, its highest level in more than a year. The weak inflation data was positive for the gold market, which is also benefiting from rising geopolitical tension. Ahead of the report gold was trading at a two-week high after President Donald Trump issued a warning on Twitter, of imminent military action in Syria. June Comex gold futures last traded at $1,258.20 an ounce, up almost 1% on the day. While gold is sees as an inflation hedge, analysts have said that weak prices pressure could help gold because it will keep the Federal Reserve from aggressively raising interest rates. Markets will get a better read on the opinions among central bankers later this afternoon when the minutes from the March monetary policy will be released. Although core CPI has now pushed above 2% for the first time in more than a year, economists don’t think it will prompt the Fed to move any quicker than previous expected. FOX news on steel price rising “dramatically”. This is just the beginning since most other tariffs come after.